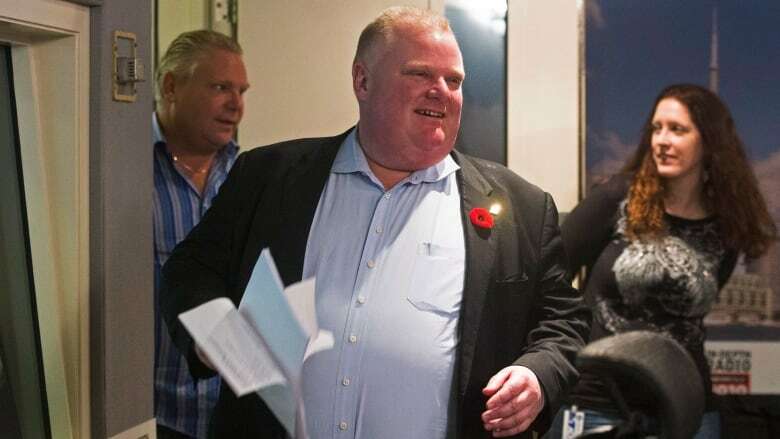 Toronto Mayor Rob Ford spent the majority of his weekly radio show talking about "mistakes" he had made, as well as taking calls from the public about those same issues. Here are some of the notable things Ford said — and had said to him — during his two-hour show on Newstalk 1010 on Sunday afternoon. 1) The mayor began his radio show with an appeal for Toronto police Chief Bill Blair to release the video at the centre of the controversy, which allegedly shows the mayor using crack cocaine: "Whatever this video shows — whatever this video shows, folks — Toronto residents deserve to see it and people need to judge for themselves what they see on this video." 2) Ford apologized for "mistakes" he had made: "I’m the first one to admit — friends, I’m the first one to admit, I am not perfect. I have made mistakes. I have made mistakes and all I can do right now is apologize for the mistakes. I sincerely, sincerely apologize to my family, to the citizens, the taxpayers of this great city and to my colleagues on Toronto City Council." 3) The mayor talked about the need to make changes in his life: "I want to move forward — but I also know to move forward, I have to make changes in my life, which I can assure you that I will do." 4) Ford reiterated his intention to keep to his job at city hall: "I’m going to ride the storm out and just keep doing what I was elected to do." 5) Later in the show, Ford expanded upon the "mistakes" he was apologizing for, including a drunken appearance at the Taste of the Danforth festival earlier this year: "I’ve made mistakes, like, where do I begin?" he said. "For example, the Danforth, that was pure stupidity. I shouldn’t have got hammered down at the Danforth. If you’re going to have a couple of drinks, you stay at home and that’s it, you don’t make a public spectacle of yourself. He also referred to things getting "a little out of control" on St. Patrick’s Day in 2012. 6) The mayor said that he would be making changes, but hinted at the problems with making promises: "To sit here and say: ‘You know, I’m going to lose 100 pounds and I’m going to be a brand new person in six months, or a year,’ I’m not going to mislead people," he said. "I’m going to do my very best to make sure these mistakes don’t happen again. And I don’t know what else to say." 7) Ford and his brother, Coun. Doug Ford, also spoke about the mayor’s intent to alter his drinking habits. Said Coun. Ford: "No one’s saying: ‘Rob, don’t have a drink ever again.’ Curb the drinking, not out in public, you can stay in your basement, have a few pops. That’s it. You’re on call when you’re out there with the people of Toronto, you’re representing Toronto, that’s the way it’s going to be moving forward." The mayor responded, "Absolutely, I’ve just gotta maybe slow down on my drinking. I don’t know what else I can say, I don’t know what else I can say." 8) Mayor Ford wouldn’t comment on the video that police say is now in their possession, though he said he would if the video is made public. "Obviously, when the video is released, I am going to explain to the best of my ability what’s in that video," Ford said, when speaking with a caller. "I have not seen the video … I still cannot comment, like I said before, on a video that I have not seen." 9) A caller who identified herself as an 81-year-old woman urged Ford to take a leave of absence: "I want you to take a medical leave … just a medical leave, I’m asking for you to do this. You need it." 10) Another caller asked the mayor how he believed he compares to the mayors that came before him at Toronto City Hall: "I don’t want to be conceited and I don’t want to toot my own horn. But I believe when it comes to my fiscal policy, I am by far the best mayor the city has ever had." 11) Ford was directly asked by a separate caller as to "what drugs you’ve ingested through a glass pipe." Ford said, "I appreciate the question, Alex, but again, I can’t comment on a video I have not seen. I have asked Chief Blair to release this video immediately. I want to see it now." 12) One caller illustrated the support Ford has from many voters, lauding his "courage" and comparing him to a famous U.S. president. "I think what’s going on to you is just a demon attack. I think there’s some similarities to what happened to John F. Kennedy and your political life. So, I just want to encourage you to carry on." 13) The mayor and his brother also spoke briefly about their belief that other politicians could find themselves in trouble if subjected to enough scrutiny. "If every politician in this country … was watched 24-7, recorded every move, recorded every conversation, a good chunk of politicians would be in jail right now," Coun. Ford said. Mayor Ford responded: "I know a lot of things about a lot of politicians, but I’m not a rat and I don't squeal on people." So, anyways, it’s not about them, it’s about me. I made the mistake, I own up to it and let’s move on here."